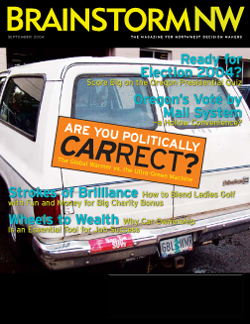 Brainstorm NW - Are You Politically Carrect? As it turns out, the only person I have known to need jumper cables at a wedding is me. It wasn’t so many years ago that I drove to a buddy’s wedding in Seattle in a VW with a bad battery. I stashed the jumper cables in the trunk, just in case. What luck: There was a hill to park on. And not a Puerto Rican in sight, just an employed white guy who was too cheap to buy a new battery. After 17 years of test-driving new cars, I’ve either fabricated, confirmed or debunked all the usual stereotypes about automobile ownership. And debunking is usually the most fun. Now that we’re in the thick of election season, with all its microscopic analysis of political beliefs, what I’d most like to do is expose people who confound stereotypes about what we’re supposed to drive. My friend and colleague Ken is someone you would call an environmentalist, and his wife works for an fish-protection advocacy group. True to their beliefs, they drive environmentally responsible cars, one of them being a Honda Civic. But when a family member from Ken’s home state of Wyoming offered up a hand-me-down 1987 Chevrolet Suburban with 240,000 rust-inducing miles on its odometer, Ken couldn’t resist. First he had to wrestle with the implications of driving a vehicle that’s a poster pig for the anti-SUV set. Better to simply fess up: He calls it the Global Warmer. Besides, “Everybody owns a Suburban in Wyoming,” he says wryly. “That’s the only car that will stay on the road in a 60 mph crosswind.” He figures the thing is worth $531-$530 of that being its new tires. The $1 is what he paid his sister for the privilege of becoming what likely will be the Global Warmer’s last owner. On the other side of the equation, my brother and sister-in-law are prototypical right-aisle Republicans, immersed in conservative-Christian church activities and home-schooling their kids until they entered Christian private schools. But when Peggy went shopping for a car a year ago, she really wanted Toyota’s hybrid Prius, a car that’s greener than God’s own garden. That earlier model wasn’t quite big enough or powerful enough for her needs, but she was genuinely interested. Just as gasoline spiked to $2.50 a gallon, he took delivery of car that goes 50 miles on four quarts. That calls for high-octane smugness, like opening a chain-saw store on the day after a hurricane. (3) are raised only so they could donate their hides to the world’s automobiles, sofas and shoes. We wouldn’t eat them, of course. Heh. Enough typing; time for stereotyping. I have no idea what sort of cars that BushCheneyKerryEdwards drive. Cheney is from Wyoming, of course, so if my buddy Ken is right, a Suburban is called for, maybe with a license plate that says EFF YOU. Bush, as a Big Oil man, needs an equally thirsty vehicle, so long as it’s bigger than Cheney’s. EFF ME? might be cute for a Bush. As for Kerry, he shouldn’t be driving, Dems being such fans of mass transportation and all. Edwards, successful trial lawyer that he is, can drive anything he has collected in lieu of client fees, with a license plate that says SUE YOU. But the truth is, I don’t care what they drive. I have my political preferences, and I’ll be casting a ballot in the fall, but I am fed up with all the politicking of Election 2004. The feature I most want in my next car is the one that recognizes political ads or stump speeches or OPB fund-raising broadcasts and automatically shuts off the radio. I don’t want to hear about weapons of mass destruction; I want to go in search of weapons of mass distraction, like Mazda Miatas with cowhide seats. I’d even take a Global Warmer.